Last changed on 11/05/18. This album contains 1 item. This album has been viewed 2288 times since 06/18/07. 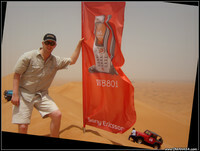 Sony Ericsson Desert Challenge in Dubai. Teams had two categories, single car entrants and dual-car entrants. I took part with Emily and in the two car team we took third place. Not bad for our first attempt! Last changed on 01/25/17. This album contains 23 items. This album has been viewed 4408 times since 04/26/07. 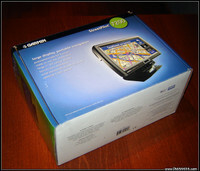 Installation and screen captures of Garmin's biggest Automotive GPS - the Streetpilot 7200 with a 7-inch touch screen. Last changed on 01/21/19. This album contains 22 items. This album has been viewed 6835 times since 04/09/07. 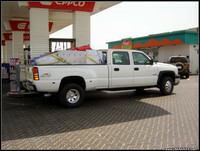 The drive from Dubai to Oman normally takes 4.5 hours... add a little... okay... a LOT of rain, and countless flash floods along the way and it takes 13 hours in a Bigfoot Jeep. A normal car? Well... you'd have still been on the road somewhere the next day. Some of the water crossings were coming up and over MY hood! That's near shoulder depth! Last changed on 05/12/16. This album contains 67 items. This album has been viewed 12124 times since 03/19/07. The weather report predicted rain. The experts warn you to stay out of the Wadis when rain is coming. We listen to their warnings, and choose to ignore them! 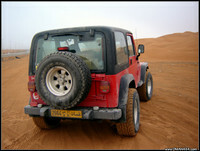 We went through Wadi Ghail, Wadi Siji and Wadi Shouka on the way to Big Red and Area 53. Last changed on 05/12/16. This album contains 16 items. This album has been viewed 4882 times since 12/08/06.